Charles was the third child born to Thomas Mead and his first wife Mary nee Dickens. His place of birth was Stewkley, Buckinghamshire, born on 6 December 1818. Brothers and sisters of Charles were John born 1816, Hannah 1817, and Benjamin in 1821. Children to Thomas' second marriage to Sarah Walter were George 1826 and Ann born in 1831. There were perhaps three more children - one unknown, Emma and Joseph, but details are not definite. The daughter of Joseph Dimmock and Hannah nee Woolhead, Sophia was born at Wing, Buckinghamshire 28 May 1819. She was their third child. John was born in 1813, Ann 1816, then after Sophia came William born 1821 and Mary in 1826. 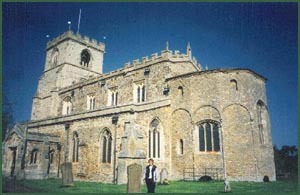 Wing is not far from Stewkley, a village larger than Stewkley, and with the most amazing church. We met the vicar at the lych gate, he opened the church and left us to look through the old burial records, but there was no mention of the name Dimmock. Charles and Sophia were married in Stewkley on 25 June 1837, Sophie's sister Ann was one of the witnesses. NOTE: (January 2008) From the 1841 UK census we know that Charles, Sophia and their 2 year old son Benjamin had followed employment, with Charles shown as a Railways Labourer in Edenbridge, Kent. With them was Sophia's brother William aged 20, also a Railways Labourer. The 1851 census found Sophia with her children Benjamin aged 11, Mary 8, Joseph 2, a nephew Eli Dimmock aged 5, their niece Sarah Dimmock, 8 months and Elisabeth Faulkner, unmarried, aged 15 - a visitor. They are shown to be living at what seems to be - Barracks in Stewkley. The search for this street, if in fact it was a street, led to much head scratching and bewilderment. The aid of a local historian was enlisted and together with him and the helpful staff at the Aylesbury Record Office, the conclusion was reached that it was a local name given to an area in the village where a lot of families lived in close proximity - hence a barracks! With the help of some old town maps the approximate position was determined in the High Street. Sophia is shown on the census as Labourer's wife, son Benjamin as an agricultural labourer, Mary and Elisabeth the visitor as Straw Plaiters. For some unknown reason Charles, head of the house, is not shown to be there at that time. The whole of Stewkley and surrounding areas were searched at the Record office, including some men in prison, Charles wasn't to be found! Strangely also, there was no mention of any brickworks on the census although we searched the particular areas where the brickworks were. This was the main form of industry and employment in the area, and could possibly be where Charles was that night. The brickworks at that particular time was said to work around the clock. But why there is no mention on the census - odd. Stewkley is a quiet little village, and though small is said to have the longest street in England. It seems that everywhere has its claim to fame! The village actually extends for about two miles, its long street containing several attractive period houses. Near the South end is the Manor Farmhouse with its early 18thc dovecote containing some 800 nesting boxes. The enormous dovecotes in England were a source of puzzlement until we found that they were necessary to supply fresh meat (and eggs) when the snow and ice of winter prevented hunting or farming. A good description of Stewkley through the years is to be read in a short extract from Robert Dickens little book Stewkley in Camera II. Robert is a gentleman of the old school and these snippets from his book are included with his blessing. To read a bit about about the village of Stewkley in earlier times. Arthur Mee referred to it as a miniature cathedral for the countryside. Its proportions and massive tower are more in keeping with a larger settlement in a key position. Sadly, we found not a single Mead or Dimmock headstone, although it is believed a couple still exist! In 1853 Charles, Sophia and their children Benjamin born 1839, Mary 1843 and Joseph 1849, left England on the BUSSORAH MERCHANT. The ship arrived in Sydney 19 March 1853, the family by then with an extra child as daughter Eliza Bussorah was born on the voyage! After they settled in Sydney, NSW three more children were born. Elizabeth in 1854, Annie 1858 and Hannah in 1860. 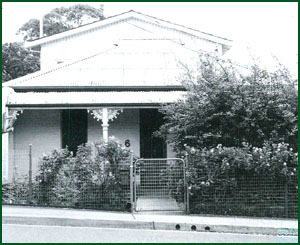 Charles was a brickmaker - the family home was at 6 Grosvenor Crescent, Summer Hill, (Sydney, NSW, Australia) the house boasting a bull-nosed verandah, with steps to the footpath. 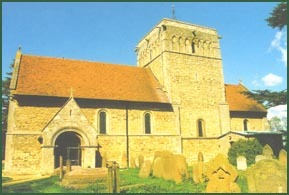 It is believed to be still there, much renovated over the years. Charles died 13 January 1895 followed by his wife Sophia on 18 December 1907. A fellow Mead family researcher has given much of the Mead information to me as a written chronicle, I have some of the family birth, death and marriage certificates but by no means all of them. There are still many Mead families living in and around Stewkley. We met one gentleman by the name of Bert - grandson of Benjamin, Charles' brother. Stewkley even today can be summed up in Bert's mother's words - but we were from the south end, we wouldn't know anyone from the north end. Many new people have moved into town - I wonder if they will ever be "locals"? Charles and Sophia - two more of my ancestors who abandoned the traditions of the old country and left their family - to live Down Under!